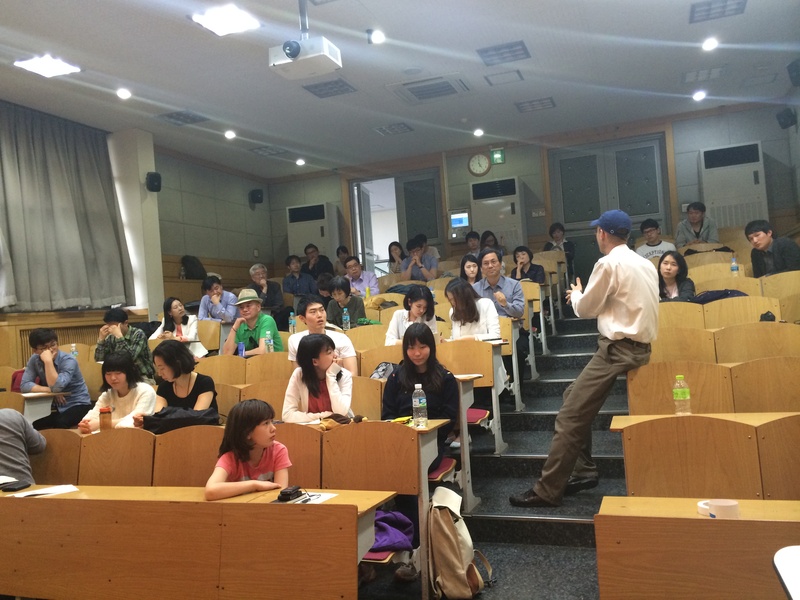 On April 26, 2014, the Naver Book Club and the Asia Institute joined forces to host a discussion on “Another Republic of Korea” (다른 대한민국) that built on Emanuel’s recent book in Korean by that title. 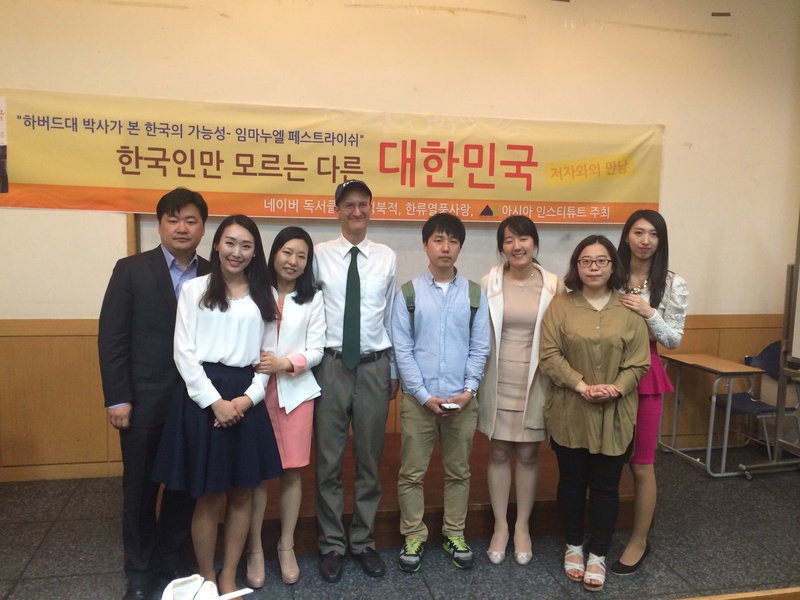 The talk was a chance for a diverse audience, including many high school students, to discuss how Korea could become a more dynamic, more responsive and more human society. 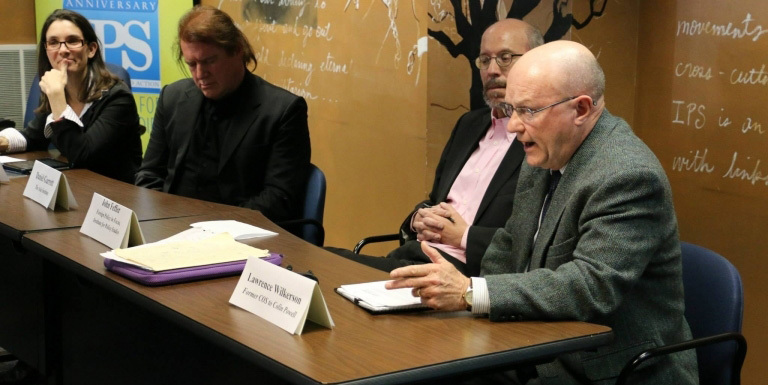 Much of the discussion between the members of the audience concerned the larger symbolic meaning of the sinking of the Sewol Ferry sinking and the needless deaths of so many students. 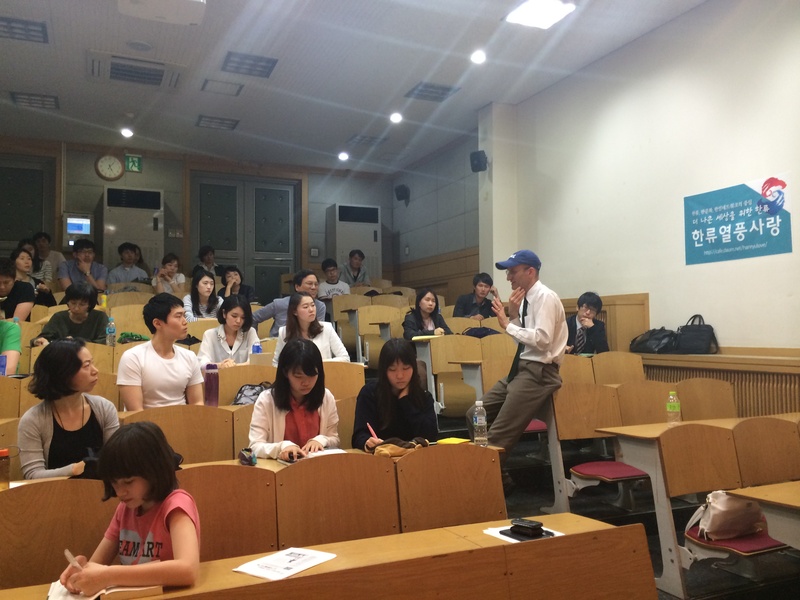 It was a rather emotional moment in which Koreans from different backgrounds expressed their profound disappointment with the culture of contemporary Korea and their worries about the future that awaits us. 한국 문화의 매력 가운데 교수가 누리는 사회적 지위를 꼽을 수 있다. 한국에선 교수가 정부 정책 심의에 큰 역할을 하고, 기업 자문도 하는 등 지식인으로 대접하는 분위기다. 외국인인 나도 ‘박사’라는 직함으로 상당한 대우를 받고 있다. This remarkable new book serves as a possible textbook for use in high school or university that presents in a systematic manner a history of handicapped people in Korea. 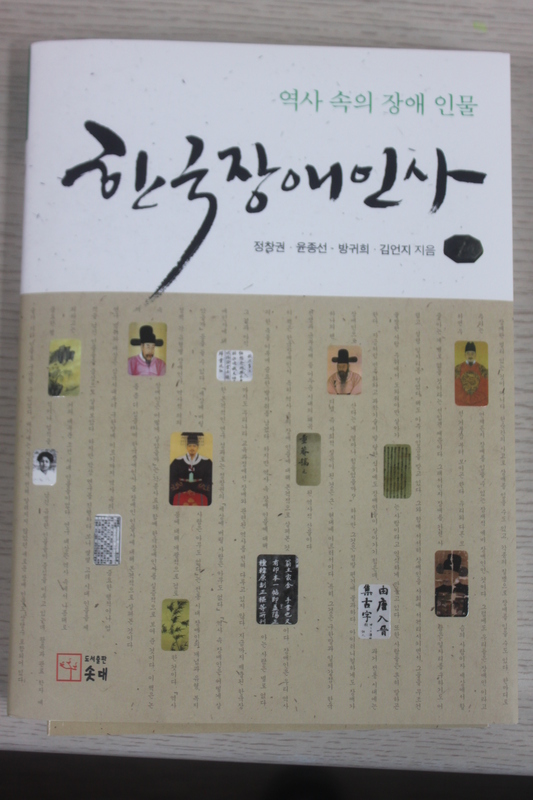 The book includes such luminary figures as King Sejong (who lost his eyesight) but also the very humble experience of handicapped people in traditional Korea who struggled to create a meaningful life for themselves. The book offers the possibility of a sense of belonging for the handicapped as part of a long tradition. It also holds up possible role models from the past to inspire and give a sense that today’s struggles are not new, but rather part of a long history. 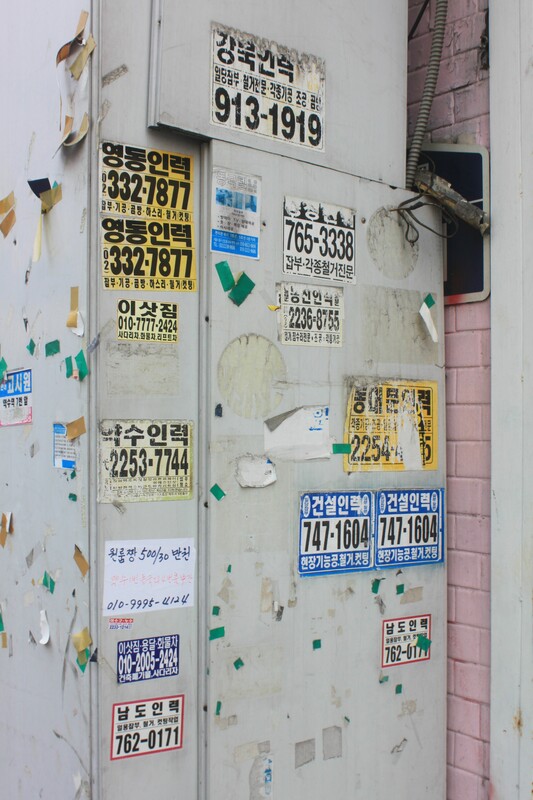 Here is a rather sad group of stickers adorning a wall that offer low-playing part time jobs to those in Seoul with no other options. They suggest to us a world that we know so very little about. We pass these signs every day, rarely stopping to read them. 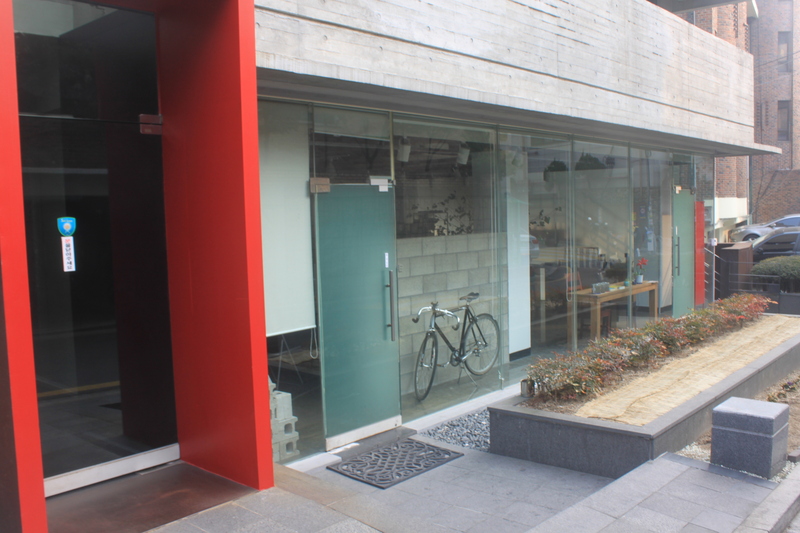 One of the weirdest things you will find in Korea is the use of bicycles as decoration. Many chick cafes, office buildings and markets will have an attractive bicycle parked in front to indicate some sort of environmental awareness and give a down-home feeling to the place. The odd part is that these attractive bicycles are never used. This bicycle in the window of a consulting firm’s office is typical. The attractive bicyles just sits there all day long to be observed. Bicycles are little more than symbols of another possible Korea that simply does not exist. We find a parallel in the extensive bike paths that were built under President Lee Myung Bak. These paths go on for miles, but they are often cut off from residential communities by freeways and otherwise extremely impractical to use. In many cases, one must brave dangerous traffic to get to and from them. There really has not been any serious effort to integrate the bicycle into Korean society. Perhaps one of the most remarkable changes in Seoul can be seen at the Shilla Hotel. 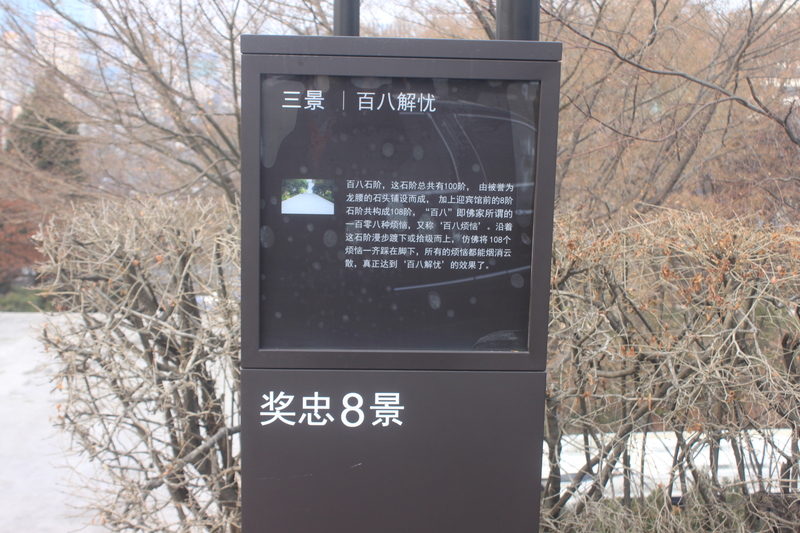 A series of plaques have gone up around the gardens surrounding the Shilla hotel that explain its history in Chinese. The signs are remarkable not only for the details they give about the history of Seoul and of the Shilla Hotel, as well as facts about the visits of Chinese statesmen. The signs are unique in that they exist only in Chinese and there are no English plaques accompanying them. That new practice stands in contrast to what we find at the much older statue of the founder of Samsung Lee Byung-Chul to be found behind the Shilla Hotel which has explanations from another age in English, Japanese and Korean. Sign in Chinese at the Shilla Hotel. I do not know when the plaques went up, but I do not think they are more than six months old. What I can say definitively is that Chinese have become by far the most dominant group of foreigners around the Shilla Hotel and that increasingly the tour guides at important places in Seoul are primarily speakers of Chinese. This rapid shift runs at odds with the general fascination of Koreans with the United States and the obsession with English in this country. 2014년 3월 26일 아시아인스티튜트는 워싱턴에서 세미나를 열었습니다. 특히 미국의 동북아에서의 역할을 100년 단위로 토론했습니다. 특히 발표자들은 한중미일이 협력해서 어떻게 기후변화에 대처할 수 있는지를 고민 했습니다. 북한전문가이며 저자인 존 페퍼 (John Feffer), 미국무부 장관 전 보좌관 로렌스 윌커슨(Lawrence Wilkerson), 미국무부 전 참모총장(former Secretary of State Colin Powell’s chief of staff), 코네티컷대학교 역사학과 교수 알렉시스 더든(Alexis Dudden), 전외교관 겸 아시아인스티튜트 연구원(Daniel Garrett)들이 모여서 이 주제를 토론했습니다. 이 세미나는 건설적이며 집중적인 방식으로 미국과 동아시아의 긴밀한 관계를 증진시켜나가기 위한 아시아 인스티튜트의 노력에 바탕을 두고 있습니다. 아시아 전환(Pivot to Asia)은 미국 경제, 정치, 안보 문제에 있어 필수적입니다. 이 지역 재균형은 항공모함 순찰이나 미사일 방어 기술 수출의 결과로 일어나는 것이 아닙니다. 전문가를 비롯한 다양한 분야의 사람들이 미국과 동아시아를 잇는 긴밀한 인적 네트워크를 구축하는 것이야말로 가장 의미 있는 효과를 가져올 것입니다. 동아시아는 유럽과 중동에 비해 너무도 오랫동안 미국의 관심에서 소외되어 왔습니다. 미국인들에게 아시아는 그들이 소비하는 제품들이 만들어지는 곳 정도로 여겨질 뿐이고, 동아시아 언어를 유창하게 구사하는 것이나 아시아 미디어에는 별다른 관심이 없습니다. 그래서 미국과 아시아의 관계는 제한적입니다. 미국은 동아시아의 정부, 대학, 비정부 기구의 수많은 컨퍼런스와 회의, 협업 프로젝트에 크게 관여하지 않습니다. 고위급 관료가 무역 협정 논의를 위해 가끔씩 방문하지만, 미국의 고등학생 축구부나 체스 챔피언이 도쿄나 베이징을 찾는 일은 드뭅니다. 동아시아와의 일상적인 관계나 과학에서 지방 정부 교류에 이르기까지 다양한 분야의 협력이 부재한 상황은 전문가가 보기에 매우 안타깝습니다. 아시아 전환은 이전의 미국과 아시아의 관계와는 근본적으로 다릅니다. 오늘날 미국은 70년대 아시아 재단 활동처럼 해외개발과 자금, 노하우를 동아시아에 일방적으로 베풀 필요가 없습니다. 미국은 동아시아 국가를 동등한 파트너로 인식하고, 심지어 몇몇 분야에서는 이들 국가가 미국을 앞선다는 것을 주지해야 합니다. 미국은 동아시아 국가들과 많은 것을 주고받을 수 있으며, 단기적으로는 정치적인 긴장에 직면할지라도 항상 장기적인 관계를 염두에 두어야 합니다. 장기적인 관계를 만들기 위해 미국은 지난 50년간의 유럽과 유지해온 관계처럼 동아시아 국가들과 동등한 파트너가 되어야 합니다. 어떤 사람들은 100년을 내다보는 장기 계획의 실효성을 의심합니다. 지난 20년간 미국의 미래를 구상함에 있어 단기적인 생각이 지배적이었습니다. 장기적인 계획을 불신하는 접근법은 비단 외교 정책에만 국한된 것이 아닙니다. 미국 문화 전반에 퍼져있는 이 불신은 소비자의 태도로 국제 관계를 바라보도록 종용합니다. 다른 나라와의 관계에서 개인의 인지도를 높여 어떻게 이득을 얻을 것인지에 대한 고려가 중시되는 것입니다. 기후변화처럼 30~50년에 걸쳐 서서히 일어나는 대규모 안보 위협을 감안할 때, 지금은 사고의 전환이 절실합니다. 데이빗 몽고메리가 자신의 저서 『흙』(Dirt)에서 이야기했듯, 해마다 1퍼센트의 표토가 유실되고 있습니다. 이는 별로 크지 않은 수치 같지만, 그 속도대로라면 50년 후엔 표토의 절반이 유실될 것입니다. 인간 생존에서 表土가 갖는 중요성, 표토가 복원되는 데 100년의 시간이 걸리는 것을 고려한다면, 이는 북핵 문제보다 더 심각한 문제일 것입니다. 그러나 이러한 위기는 단기적인 사고에서는 간과되기에 십상입니다. 우리의 상상력을 사로잡는 수많은 신기술이 순식간에 기적과도 같은 일을 만들어 낼 수 있는 오늘날, 미사일 방어 프로그램으로는 막기 어려운 장기적인 위협이 서서히 다가오고 있다는 것은 비극이 아닐 수 없습니다. 그러한 위협은 우리 눈에 잘 보이지 않습니다. 식물들은 정지해 있는 것처럼 보이지만, 이는 느린 움직임을 포착하지 못하는 우리의 눈이 만들어내는 착각입니다. 자연환경 속에서 속도가 느린 변화에 무감각한 것은 치명적입니다. 제가 알기에 미국의 싱크탱크처럼 100년 단위로 안보와 국제 사회 참여에 대한 논의를 하는 기관이 별로 없습니다. 이런 점에서 장기적인 안보에 대한 논의는 다른 국가들의 관점을 확장시키는 데 도움을 줄 것입니다. 장기적인 안보를 생각함에 있어 ‘7대손 원칙’이라 불리는 인디언들의 전통을 참고할 필요가 있습니다. 즉, 우리는 우리의 결정이 7대손, 즉 먼 후세에게 어떤 영향을 미칠지 고려해야 합니다. 2014년 미국토목학회는 미국의 사회 기반 시설 품질에 D+를 주었습니다. 하지만 여기에 ‘7대손 원칙’을 적용해보면, F를 받았어야 하는 건지도 모릅니다. 아시아에서 미국의 역할을 생각할 때, 저는 어릴 적 아버지가 들려주신 말씀을 떠올립니다. 아버지는 일 년 이상 같은 일을 하지 말라고 말씀하셨습니다. 이는 전직의 말씀 아니고 한 조직에서 계속 같은 직위에 머물지라도, 지속적으로 혁신하고 자신의 업무 방식을 변화시키며, 새로운 현안과 상황에 적응하라는 의미였습니다. 미국도 끊임없이 한국 및 일본과 공조하며, 동아시아 기후변화 위협에 대한 포괄적이며 장기적인 전략을 수립해야 합니다. 동북중국 사막화는 동아시아 생태계를 파괴하고 있습니다. 미세먼지에 인한 공해는 위협적인 수준에 다다랐으며, 경제 구조의 재조정까지 요할 정도입니다. 해양사막화도 심각합니다. 진정한 행동이 촉구되는 때입니다. 그리고 미국은 한중일 그리고 다른 아시아 국가들과 공조하여 후쿠시마 원전 사태에 대처하기 위한 백년대계를 세워야 합니다. 아시아인스티튜트도 이 문제에 적극적입니다. 이는 기자회견이나 정치적 쇼로는 해결할 수 없습니다. 많은 사람이 오랜 기간에 걸쳐 구체적이고 집중적인 프로젝트 속에서 협력해야 합니다. 그러나 동아시아의 압도적인 안보 위협을 목도하며, 미국의 많은 사람들은 실제적인 것보다 새로운 위협에 더 신경을 씁니다. 그들은 새로운 냉전을 상정하면서, 미 국방부의 기존 구조를 정당화합니다. 오늘날의 현실적인 위협에 맞춰 제도와 이론을 개선하기 위한 사고의 재조정이나 구조 개편에는 관심이 없습니다. 냉전구도는 국내 경제와 사회는 물론 국가 안보에 대한 사고를 크게 왜곡시켰습니다. 우리는 30~50년의 시간을 두고 동아시아 기후변화에 대처할 수 있는 계획을 세워야 합니다. 그러한 장기 환경 프로젝트는 경제에 새로운 안정을 가져다줄 것이며, 장기적인 인적 관계를 강화할 것입니다. 이는 궁극적으로 국제 관계 안정화에도 기여할 것입니다. 미국은 동아시아 국가들과 공조하여, 이 분야에 대처하기 위한 관리 모델로서 아시아 사이버스페이스 행정에 대한 근본적인 합의를 이끌어낼 수 있을 것입니다. 정보 보전과 인터넷 중립성의 확보를 통해, 미국은 동아시아와 협력적인 관계를 맺어야 합니다. 마지막으로 미국은 한중일 그리고 다른 국가와 공조하여 통일 한반도의 미래를 함께 구축해나가야 합니다. 이는 사회, 경제의 기존 구분을 뛰어넘는 새로운 제도와 문화를 만드는 희망이 될 것입니다. 한반도 평화 구축에 미국이 기여할 수 있는 부분은 많습니다. 이는 6자 회담 참여와 같은 외교 분야에만 국한되지 않습니다. 생태 운동가, 도시 계획자, 고교 교사, 비정부 기구 활동가 등 다양한 미국인들이 동아시아와 한반도 미래에 기여할 수 있습니다. 이 세미나는 동아시아에서 미국의 역할을 고민하는 도전적인 토론의 장이 될 것입니다. 많은 사람들의 관점과 제언이 새로운 미래로 향하는 길을 만들어내기를 희망합니다. We tend to overlook the importance of Manchuria in East Asia. It is the case of a country that was so successful that it put itself out of business and literally disappeared as a cultural and political entity. Manchuria was the most powerful nation in the region in the 17th century with a remarkable administrative organization the rewarded those with talent and vision and a powerful vision for the region. And yet today, the Manchurian language is unknown to all but a few specialists and even then is a dead language. Even more striking is the fact that few, if any, would identify themselves as “Manchu” today. Basically everyone has become Chinese. What happened in the process of modernity and of nation building, the transformation of Asian civilization that led to the complete destruction of Manchurian identity? I think therein lies the answer to many of our questions about the civilizations of China, Japan and Korea and some hints as to what is to come. We can think of Manchuria as the inspiration for much of the administrative and strategic culture of East Asia in the 17th and 18th centuries. When Chinese think back on what was Chinese imperial power at its height, they are inevitably thinking about the reigns of Kangxi and Qianlung. For that matter the decor in Chinese restaurants, the traditional furniture and vases that we see in hotels and in the Chinoiserie across Europe is product of exactly that period of Manchu rule. You could say that the first conception of modernity in East Asia started with the exposure of China and Korea to the military culture of Manchuria inthe 1620s. Modern administration and military efficiency in East Asia was learned from the Manchu model. Even if the Koreans detested the Qing Dynasty of the Manchus, they never the less learned from it. Many many Chinese went over to the Manchu side in the late Ming. It was in a sense the institutional equivalent of Samsung for the 17th century, an all-powerful organization (the eight banners administrative system) perfectly organized and unstoppable–a contrast with the weak Ming. There were scholars like Phillip Kuhn at Harvard who had some proficiency in Manchu, but still limited. Increasingly scholarship is based on Chinese texts–almost meaningless in the early Qing when the Manchu texts were far more central to governance. Part of the problem of locating the Manchurian impact in East Asia results from unstated influence. For example, you might say that there is hardly a trace of North Korea to be found if you walk around in South Korea. And that fact is true in the simplest sense. But South Korean culture evolves and grows today in opposition to what Pyongyang is, or what Pyongyang is imagined to be. There never need be any overt communication or sophisticated dialog between the North and South, but what they do is always linked together. Such was the case in Manchuria as well. Although Korea or Japan may not have spoken much about Manchuria, they were profoundly aware of its institutional and cultural power. It does not stop there. England adopted the civil service system, which would power the new British imperial global system, in the 1870s, at precisely the moment that such a system had ceased to function effectively in China. But the British proposals for civil service refer very explicitly to the Chinese origins of this system. That is right, England took the skeleton required for running an imperial system from China, the country it was in the process of turning into a semi-colony after the Opium Wars. We can see that process as a form of cultural “king killing.” As the old civilization loses its symbolic power, the best parts are selected by others. I suggest that Korea risks having its own civilization disappear like that of Manchuria. Although Manchuria had so much impact on the administrative culture of China, Manchuria as a unique cultural identity has vanished. No one speaks Manchu and few identify themselves with that cultural tradition. It is in a sense Manchuria was completely absorbed in other cultures and has ceased to have a ready identity. Also, in the case of Japan, imperialism in China was articulated through the support of a modern Manchu state, an attempt to create by fiat the Manchu Kingdom that had lost its support. We can see the tragedy of Pu-i in the Japanese effort to make use of the Manchu imperial past. It was part of the expansion into China, but that was linked to the adoption of Manchu governance as part of modernization. But I wonder whether the fascination with Manchuria had a bit to do with Japanese admiration for this non-Chinese tribe that had so well digested Chinese bureaucratic culture and so effectively modernized its military in the 17th century. It is in this sense that Manchuria is the hidden civilization of modernity.